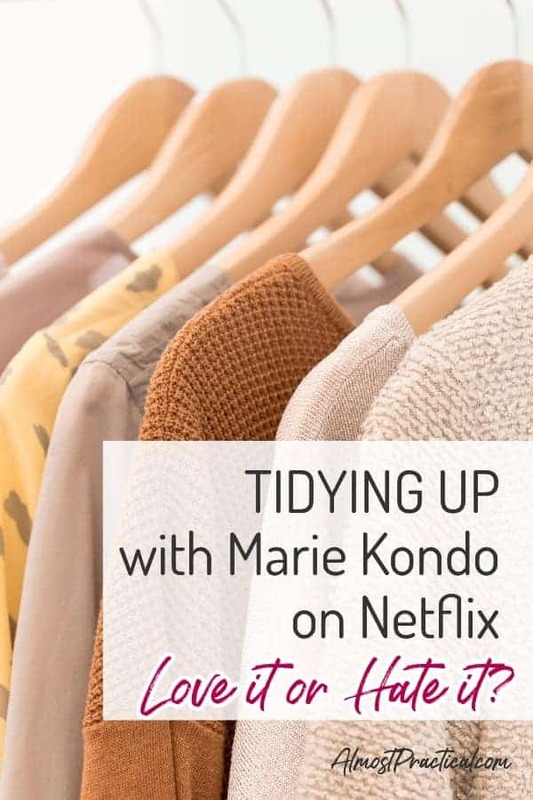 Tidying Up with Marie Kondo on Netflix - Love It or Hate It? Tidying Up with Marie Kondo on Netflix – Love It or Hate It? The show Tidying Up with Marie Kondo on Netflix has created a lot of buzz lately both positive and negative. If you are not familiar – Marie Kondo is the author of the popular book The Life Changing Magic of Tidying Up, the accompanying workbook called Spark Joy: An Illustrated Master Class on the Art of Organizing and Tidying Up (The Life Changing Magic of Tidying Up), and even The Life-Changing Manga of Tidying Up: A Magical Story in graphic novel format. In these books Marie outlines her own method of organization which she calls the Kon Mari Method. I actually wrote a book review of the Kon Mari method here a few years ago before it became a media sensation. So, the Netflix show – Tidying Up – may not spark joy in everyone that watches it but it certainly has sparked conversation. I know these are meant to poke fun at the process and some of them are pretty funny but I think they miss the point that the show is trying to make. If you are trying to add some organization to your life or are just wondering whether you should invest time in watching the show, then these points might help you decide. What is the Tidying Up Show All About? In the show Tidying Up, Marie Kondo works with an assortment of families in different life situations that are struggling with organization. Some have small children, some are empty nesters, some have experienced life events that have caused a big ripple in their status quo, etc. She works with these families to declutter and bring a sense of balance back to their daily routine. The people that love the show seem to like it because it has given them ideas that they can use to tidy up their own homes. But the one thing that I have noticed from the comments that I have read is that many fans of the show have actually read the book – The Life Changing Magic of Tidying Up – so they were already familiar with the Kon Mari Method of organizing before watching. Why Do People Hate the Show? For as many people that like the show Tidying Up, there seems to be an equal number that dislike it. it's all common sense – why do these people need help with organization? I can see both sides of the coin on this one, and this is my two cents. To get the most out of watching the show Tidying Up, you really need to read the book The Life Changing Magic of Tidying Up. In the book, Marie explains in detail the philosophy behind her methods. I think the key takeaway is that purpose of organizing is to create balance and order in a life that may feel chaotic at times. Many people get the urge to clean up when under pressure … But this urge doesn’t occur because they want to clean their room. It occurs because they need to put something else in order. When your life is spinning out of control one of the ways that you can restore balance is to organize the things that are around you. And part of that process is getting rid of some your stuff. If you take the concept of organizing very literally, then you might be one of the people that doesn't really like the Tidying Up show. It is very logical to say – well, if there is a mess, why not just put everything away. Easy. But the people that need help with organization are dealing with more than just an over abundance of stuff. They are dealing with the emotional weight that comes with all of those possessions. There are many different reasons why people can't seem to make decisions about the piles that surround them. your life is already busy enough, when will you find time for this? space is limited – how can you possibly find a spot for everything? you spent money to buy the stuff, how can you get rid of something that cost so much even if you don't use it? The Kon Mari Method asks us to hold each one of our possessions and ask ourselves if it “sparks joy” precisely because we are often emotionally attached to our stuff for many of the reasons that I listed above. If you received a gift from grandma that you don't really like, you might feel obligated to keep it because it was from grandma. So, you spend your resources taking care of this thing that you don't want. and you might need to maintain this thing in some way – dusting it, keeping batteries charged, whatever maintenance this particular thing needs. It basically weighs you down. As hokey as it seems, thanking this item and thanking your grandma for thinking about you, spending money and time on you, and for caring about you can give you the emotional permission that you need to finally get rid of it. Gratitude goes a long way. In many of the episodes of Tidying Up that I have watched so far, I see families that are looking for permission and support to make those difficult decisions about their possessions. Sure, they could have organized it all themselves – and they actually do most of the work on their own. But they guidance on how to how to make the decisions – they need a game plan. Some people criticize the show for this. They say that Marie doesn't do anything, the people do it all themselves. There is a difference between organizing and cleaning. If you want to learn how to organize and stay organized you have to learn how to do it yourself to create the habit. If you want someone to come and clean for you – then you need a cleaning service. Will the Show Tidying Up Help You To Get Organized? The show Tidying Up will give you some ideas on how to get organized. But if you really want to implement the Kon Mari Method you should read the book The Life Changing Magic of Tidying Up before you watch the show. You will understand the concepts presented in the show much better if you read the book first. Is the Show Worth Your Time To Watch? From a pure entertainment perspective I would say that it is not as extreme and shocking as many of the other reality shows out there. You won't see these earth shattering, jaw dropping transformations. When Marie arrives on the scene, many of the families are stressed out and overwhelmed. At the end of the show, their spaces are definitely neater and more organized. However, the most significant change that occurs is something that is not easy to see on TV – it's the transformation that happens on the inside. The families are happier and have found a sense of balance that they did not have when they started the organizing process. I'd say – watch a few episodes and see how you like it. Personally, I didn't love the first episode, but I found the next few very interesting. One of the more popular concepts in the Kon Mari method is how to fold clothes. I have been folding my clothes this way for years and standing them up vertically makes so much sense. 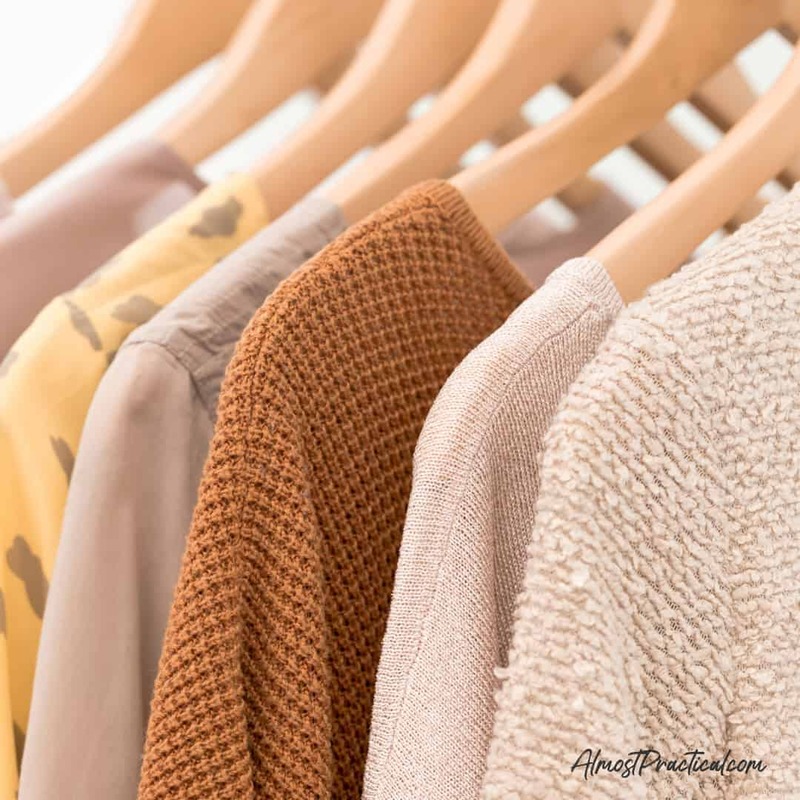 You can find the exact piece of clothing you want to wear and just pluck it out without disturbing the rest of the pile.